If the answer is yes, grab your school robes and wand—you&apos;re ready to climb aboard the Hogwarts Express. 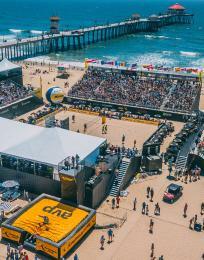 Huntington Beach is just 50 miles down the freeway from one of Southern California&apos;s biggest new attractions: The Wizarding World of Harry Potter at Universal Studios. For any fan of the book or movie series, it’s worth taking a quick break from the sun and surf to visit J.K. Rowling’s literary universe brought to life. 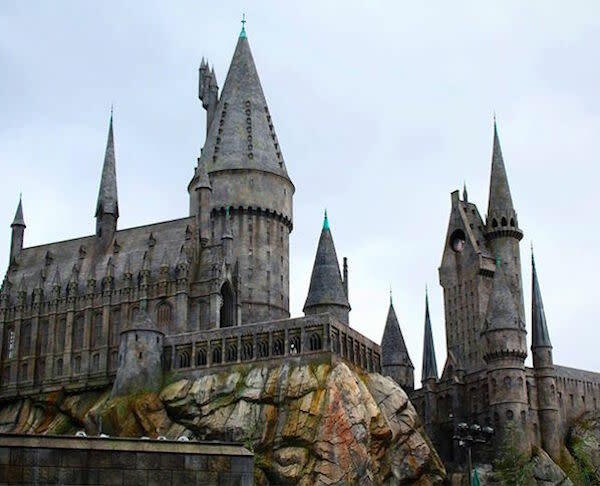 Celebrating its grand opening earlier this year in April,The Wizarding World of Harry Potter is the star attraction for Universal Studios, so plan accordingly. Purchasing your ticket online in advance usually grants you one-hour early admission to the park, which makes all the difference. Take full advantage of the hour and make a beeline for the impressive archway welcoming you to Hogsmeade Village. 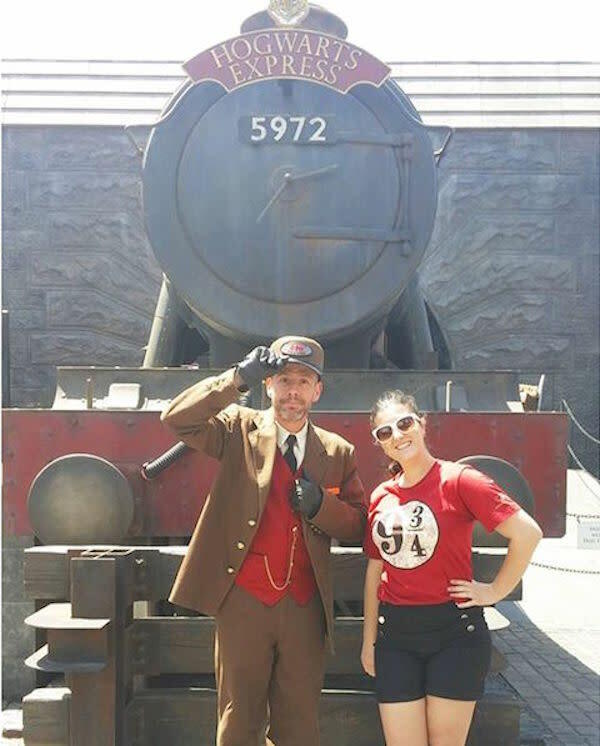 Stepping over the threshold into the magical land places you in front of the Hogwarts Express train, where a smiling conductor invites you to stop for a photo. To your left, Zonkos Joke Shop and Honeydukes storefronts immediately bring to mind scenes from the book. Throughout the village, park employees and loyal fans alike are dressed in full wizarding regalia, from black robes with pointed hats to Hogwarts house color. 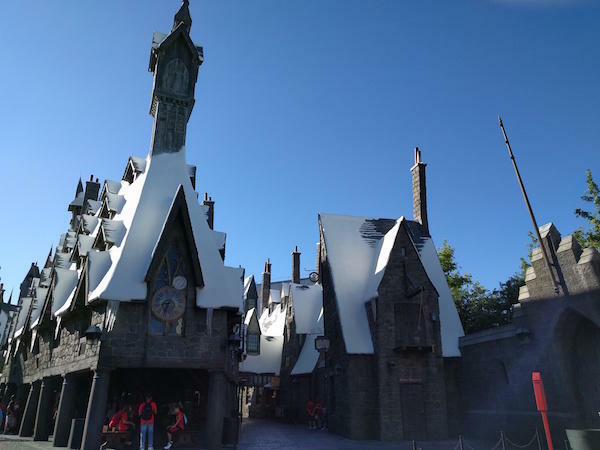 You can easily stop and meander through the shops and alleyways, but to beat the crowds, your first stop should be the 3-D ride Harry Potter and the Forbidden Journey. (Pro tip: Large bags must be stashed in free lockers just inside castle gates; leave oversized packs at your hotel if you want to skip this step of the queuing process). Housed inside a faithful replica of Hogwarts castle, the ride features a line that winds through favorite scenes like Dumbledore’s study, the Fat Lady’s portrait outside Gryffindor’s common room and the Herbology greenhouse. As you approach the loading platform, glance up to see the Sorting Hat bid you adieu. Once you’re firmly strapped in with your 3-D goggles, Hermione will enchant your vehicle so you can follow Harry and Ron in an aerial journey through the Forbidden Forest and castle grounds. 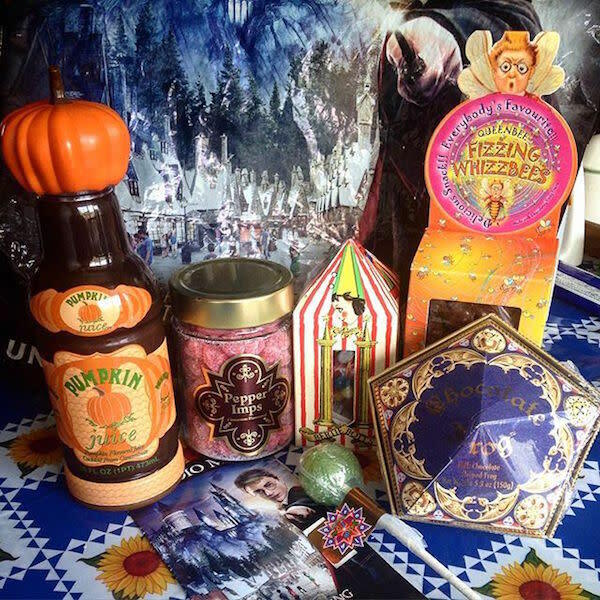 The ride exits into Filch’s Emporium of Confiscated Goods, a Hogwards general store of sorts with everything from keychains and mugs to Marauder’s Map replicas. Families with small children should pay a visit to the Flight of the Hippogriff ride just across the way. 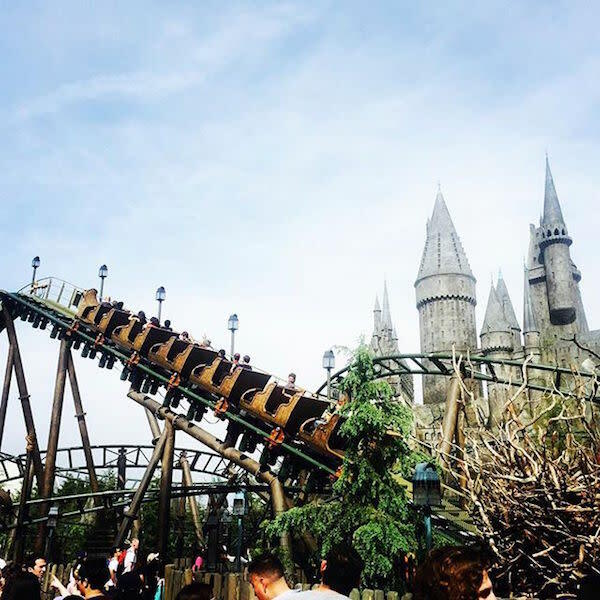 The kiddie coaster doesn’t have the daring drops or special effects of Forbidden Journey, but Universal’s first outdoor roller coaster offers views of Hogwart’s exterior as you ride the rails around each bend. Once you’ve had your adrenaline fix, it’s time to revisit the charming storefronts that recreate the wizarding shopping experience. The village is home to not only favorites from Hogsmeade, but also Diagon Alley. 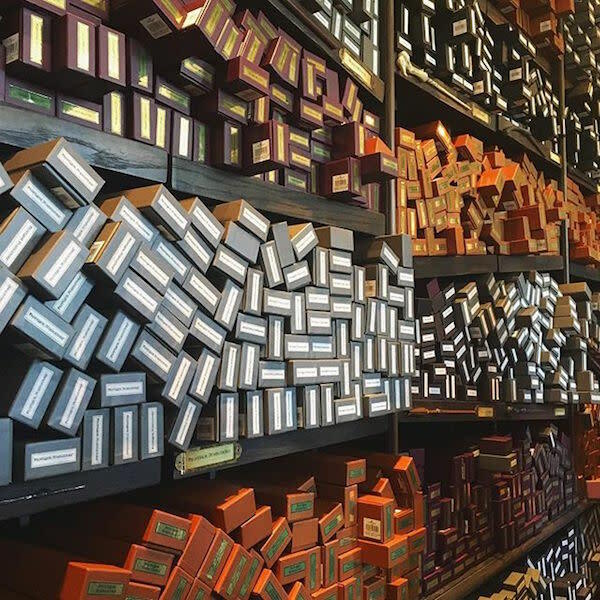 Hop in the queue to watch an Ollivander’s wand fitting in a room fitted floor to ceiling with boxes of wands, then exit through a secret door to access Wiseacre’s Wizarding Equipment (purchase specialty or character wands here). Next, any proper witch or wizard needs school robes—Gladrags Wizardwear has house apparel for sale, including robes, T-shirts, scarves, ties and hats. Many of the shops are interconnected, so through an open doorway you’ll also find Quidditch equipment in Dervish and Banges or notebooks and quills at the Owl Post. 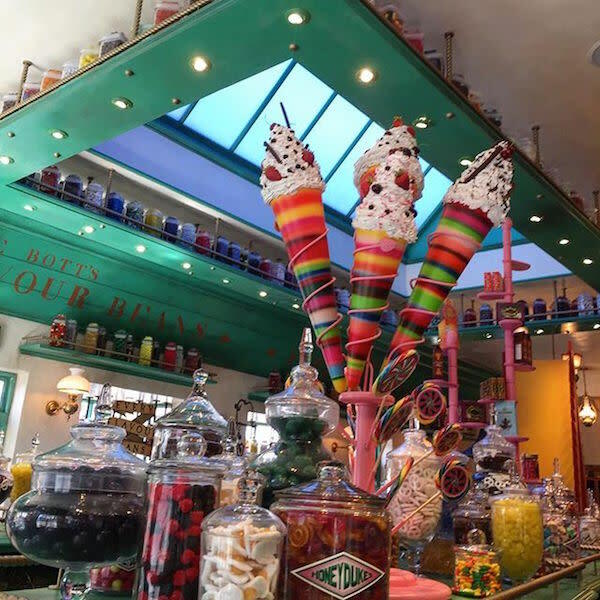 For the young at heart, Honeydukes and Zonkos carry beloved toys and treats like Chocolate Frogs, Pygmy Puffs, Sneakoscopes and, of course, Bertie Bott’s Every Flavoured Beans. 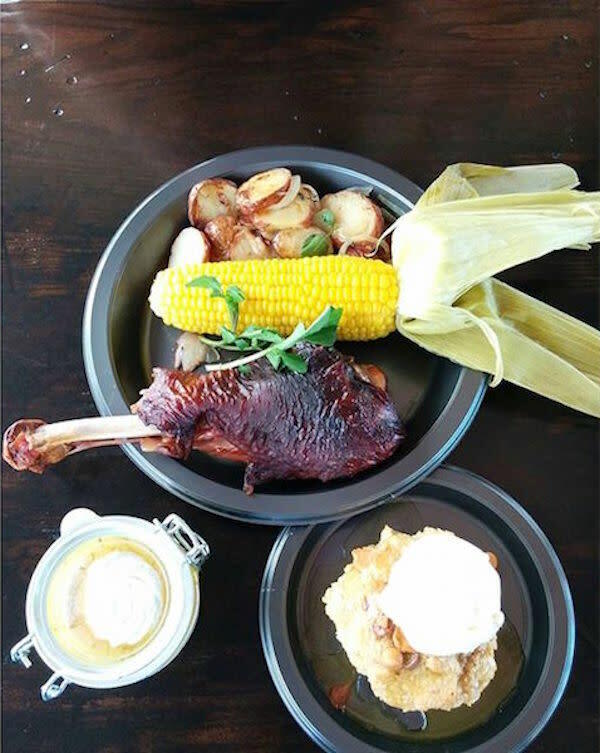 Avoid the crowd queuing up outside the Butterbeer cart and hop in line for lunch at the Three Broomsticks. The food is several notches above typical theme park fair and prices are reasonable (entrees range from around $13-21). 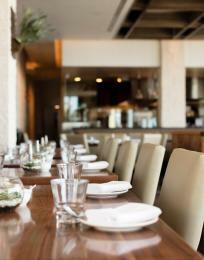 For lunch and dinner, choose from platters like traditional English bangers and mash, prime rib or a turkey leg. The 21-and-over set can also enjoy a few specialty beers, including the Dragon’s Scale lager or Hog’s Head Brew ale. 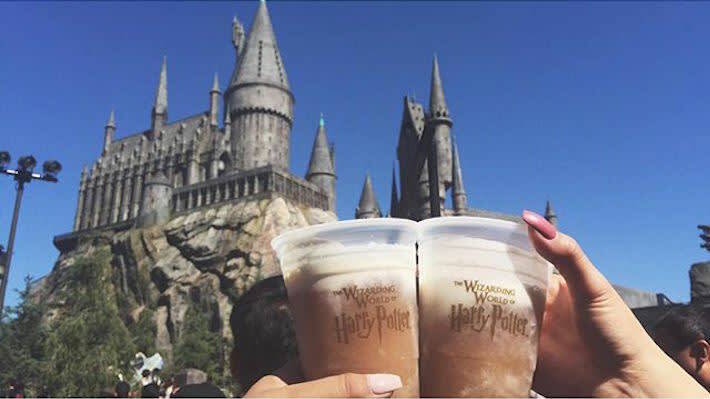 No one should leave Hogsmeade without at least one sip of the most popular beverage in the wizarding world: Butterbeer. 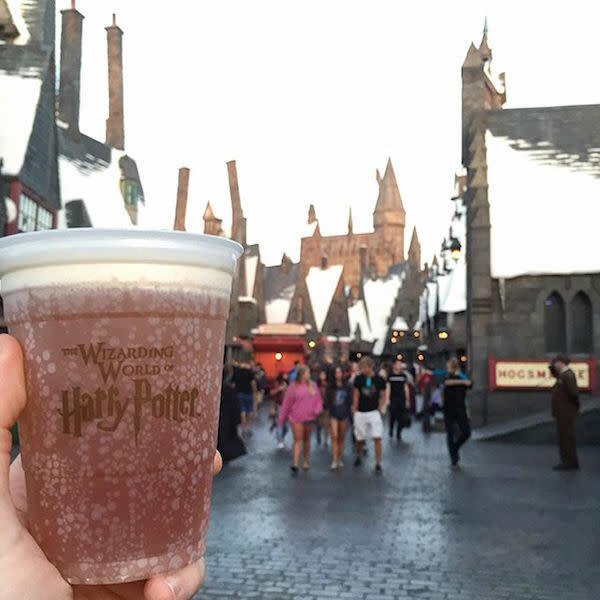 Though it’s known to give a bit of a buzz to witches and wizards in the books, the real-life iteration is completely nonalcoholic and can be served chilled or frozen. Golden in color with a frothy head, it’s close in flavor to a cream soda topped with butterscotch foam. Deliciously sweet, it’s the perfect ending to a magical afternoon. The Wizarding World of Harry Potter is located at Universal Studios Hollywood, 100 Universal City Plaza, Universal City, CA 91608. Park hours vary; check universalstudioshollywood for the most up-to-date schedule. 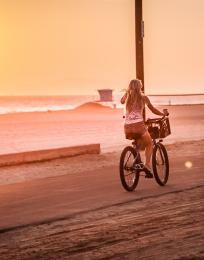 Single-day tickets start at $90 when purchased in advance.